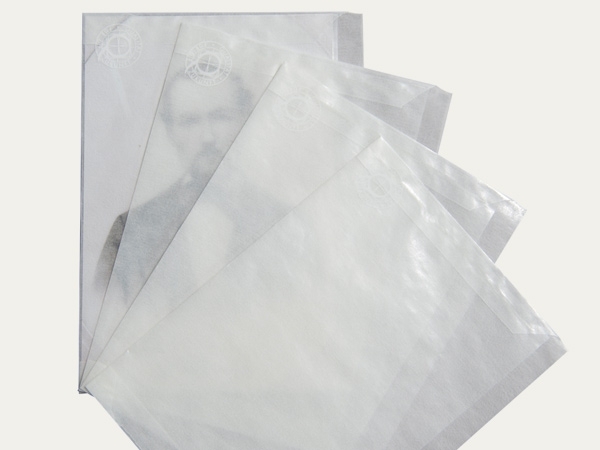 The transparent archival paper developed by KLUG-CONSERVATION differs from conventional glassine papers. It is produced free from sulphur, acids, lignin, plasticisers and metals and using 100 % fresh fibres, according to our own formulations. It has passed the Photographic Activity Test (PAT) and is suitable for long-term archiving. Unbuffered, photographic archival envelope enclosures in U-style, made from transparent archival paper. The envelope opening is on the longer side. Suitable for archiving photographs, negatives and slides.